... vulnerabilities are reported in versions prior to 10.7. Solution: Update to version 10.7. Edited by AplusWebMaster, 13 September 2012 - 08:58 AM. Impact: Connecting to a third-party VNC server with "Encrypt all network data" set may lead to information disclosure..."
Available for: iPhone 3GS and later, iPod touch (4th generation) and later, iPad 2 and later..."
"... can be downloaded and installed using iTunes*..."
Solution: Upgrade to iOS 6 via Software Update. Solution: The vendor has issued a fix (6.0). "iOS6 released: a few CVEs addresses, breaks mapping." Edited by AplusWebMaster, 20 September 2012 - 07:30 AM. Solution: Update to version 10.8.2 or 10.7.5 or apply Security Update 2012-004. Edited by AplusWebMaster, 20 September 2012 - 07:57 AM. ... vulnerabilities are reported in versions prior to 5.1. Solution: Update to Apple TV Software version 5.1. Edited by AplusWebMaster, 25 September 2012 - 11:18 AM. Sep 28, 2012 - "Apple CEO Tim Cook says the company is "extremely sorry" for the frustration that its maps application has caused and it's doing everything it can to make it better. Cook said in a letter posted online Friday that Apple "fell short" in its commitment to make the best possible products for its customers. He recommends that people try alternatives by downloading competing map apps from the App Store while Apple works on its own maps products.... 'had released an update to its iPhone and iPad operating system last week that replaced Google Maps with Apple's own maps application. But users complained that the new maps have fewer details, lack public transit directions and misplace landmarks, among other problems." ... vulnerabilities are reported in versions prior to 2.1.1. Solution: Update to version 2.1.1. Edited by AplusWebMaster, 04 October 2012 - 05:39 PM. Oct 17, 2012 - "Multiple vulnerabilities exist in Java 1.6.0_35... addressed by updating to Java version 1.6.0_37..."
"Java for OS X 2012-006 delivers improved security, reliability, and compatibility by updating Java SE 6 to 1.6.0_37. 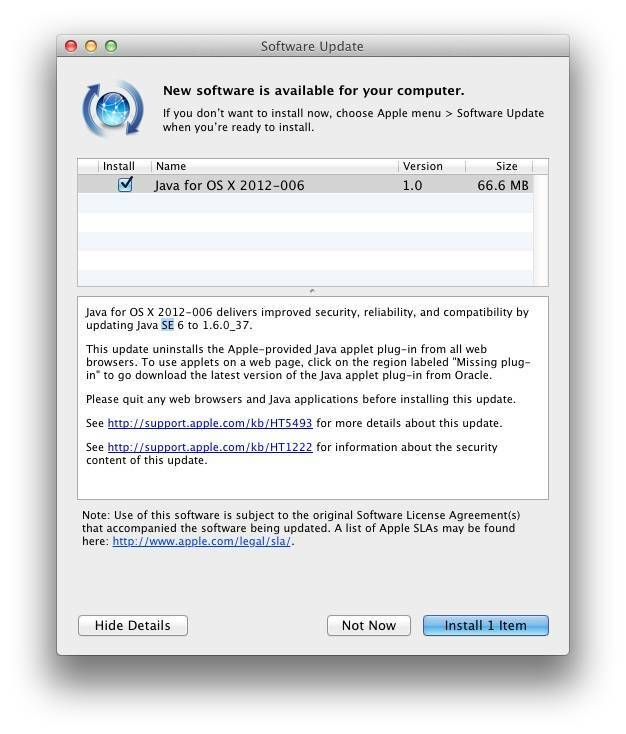 This update uninstalls the Apple-provided Java applet plug-in from all web browsers. To use applets on a web page, click on the region labeled "Missing plug-in" to go download the latest version of the Java applet plug-in from Oracle. Please quit any web browsers and Java applications before installing this update..."
Edited by AplusWebMaster, 21 October 2012 - 05:39 AM. This update is available via iTunes and wirelessly." Solution: Apply iOS 6.0.1 Software Update. The vulnerabilities are reported in versions prior to 6.0.2 running on OS X Lion and OS X Mountain Lion. Solution: Update to version 6.0.2. Edited by AplusWebMaster, 02 November 2012 - 06:56 AM. ... vulnerabilities are reported in versions prior to 7.7.3. Solution: Update to version 7.7.3. Edited by AplusWebMaster, 08 November 2012 - 07:38 AM. Dec 13, 2012 - "This update to the new iTunes addresses an issue where new purchases in iCloud may not appear in your library if iTunes Match is turned on, makes iTunes more responsive when searching a large library, fixes a problem where the AirPlay button may not appear as expected, and adds the ability to display duplicate items within your library. This update also includes other important stability and performance improvements." Available on Apple Software Update. "... everyone and their dogs are trying to download the delta update and Apple’s servers are having a hard time..."
Dec 18, 2012 - "... these Wi-Fi issues were supposed to be fixed with the release of iOS 6.0.1 but notes that users have still reported problems connecting to known Wi-Fi hotspots even after installing the patch..."
Edited by AplusWebMaster, 18 December 2012 - 04:33 PM. Edited by AplusWebMaster, 29 January 2013 - 09:26 AM. ... vulnerabilities are reported in versions prior to 2.2.1. Solution: Update to version 2.2.1. Feb 14, 2013 - "An -old- vulnerability in the iPhone's lock screen and Emergency Call feature appears to have resurfaced for a third time in iOS 6.1. With the right sequence of button clicking, it's possible to get to an iPhone user's voicemails, contacts, and photos—even if the iPhone is locked and password protected..."
Edited by AplusWebMaster, 19 February 2013 - 06:00 AM. Edited by AplusWebMaster, 20 February 2013 - 10:44 AM. System Requirements: iPhone 3GS and later, iPad 2 and later, iPod touch 4th generation and later, iPhone 5 ..."
Feb 19, 2013 - ... Resolution: To resolve this issue, update to iOS 6.1.2..."
Edited by AplusWebMaster, 20 February 2013 - 06:16 AM. Feb 28 2013 - "... Amazon has revisited the webpage and the update. Version 3.6.2* of the Kindle app for iOS includes both a fix for the registration issue and "Various Bug Fixes and Security Fixes"..."
Last Updated: 2013-03-02 18:23:36 - "Apple has recently stepped up its response to security issues involving 3rd party plug-ins. They have aggressively used its anti-malware tool sets to enforce minimum versions of Adobe Flash*, Oracle Java, and similar popular plug-ins..."
Mar 1, 2013 - "... When attempting to view Flash content in Safari, you may see this alert: "Blocked Plug-in"
'Adobe Flash Player' is out of date. - Click 'Download Flash…' to have Safari open the Adobe Flash Player installer website. - Download the latest Adobe Flash Player installer--click the "Download now" button. - Open the downloaded disk image. - Open the installer and follow the onscreen instructions...'"
Edited by AplusWebMaster, 02 March 2013 - 07:07 PM. Edited by AplusWebMaster, 11 March 2013 - 03:08 PM. Solution: Update to version 6.0.3. Solution: Update to OS X Mountain Lion 10.8.3 or apply Security Update 2013-001. Apple releases security patches for a variety of issues in OSX. Edited by AplusWebMaster, 16 March 2013 - 01:28 PM. Solution: The vendor has issued a fix (iOS 6.1.3) as part of APPLE-SA-2013-03-19-1 iOS 6.1.3. Solution: Apply iOS 6.1.3 Software Update. Solution: Update to version 5.2.1. Edited by AplusWebMaster, 08 April 2013 - 10:42 AM. May 2, 2013 - "This update contains security content originally included in previous iOS Software Updates..."
May 3, 2013 - "... iPhone 5 only..."
A remote user can spoof digital certificates. Solution: The vendor has issued a fix (11.0.3). ... vulnerabilities are reported in versions prior to 7.7.4. Solution: Update to version 7.7.4. Edited by AplusWebMaster, 23 May 2013 - 01:55 PM. Solution: The vendor has issued a fix (10.8.4; Security Update 2013-002). Solution: The vendor has issued a fix (6.0.5). Edited by AplusWebMaster, 05 June 2013 - 05:16 AM. "... issues were addressed by updating to Java version 1.6.0_51 ..."
Edited by AplusWebMaster, 19 June 2013 - 01:16 PM. Solution: Apply Security Update 2013-003. Jul 18, 2013 - "This update is recommended for MacBook Air (mid 2013) models. This update fixes an issue that in rare instances may cause an intermittent loss in wireless connectivity, an issue with Adobe Photoshop which may cause occasional screen flickering, and an issue which may cause audio volume to fluctuate during video playback." Edited by AplusWebMaster, 20 July 2013 - 09:10 AM. ... vulnerability can be exploited by malicious people to cause a DoS... reported in firmware versions prior to 7.6.4. Solution: Update to firmware version 7.6.4 via AirPort Utility. Edited by AplusWebMaster, 09 September 2013 - 03:44 AM. ... vulnerabilities are reported in versions prior to 5.1.10 running on OS X Snow Leopard version 10.6.8 and OS X Snow Leopard Server version 10.6.8. Solution: Update to version 5.1.10. ... vulnerabilities are reported in versions prior to 10.8.5. Solution: Update to version 10.8.5 or apply Security Update 2013-004. Edited by AplusWebMaster, 14 September 2013 - 03:17 AM. ... vulnerabilities are reported in versions prior to 2.2.2. ... A local user can invoke the Apple Control Center and bypass the passcode lock screen to access photos and related photo sharing applications.... No solution was available at the time of this entry. Sep 19 2013 - "... Apple released its iOS 7 mobile operating system update on Wednesday, although download problems have meant that thousands still haven't been able to upgrade to the latest software. As seems typical with iOS updates, the release of iOS 7 didn't go smoothly. Thousands of keen iPhone and iPad users tried to download the iOS 7 update as soon as it went live... some users inundated with error messages after trying to install the software, while others were unable to download it at all... download failures likely having occurred because the firm's network and servers infrastructure couldn't handle the huge surge in traffic..."
... vulnerability is reported in versions prior to 11.1. Solution: Update to version 11.1. Edited by AplusWebMaster, 21 September 2013 - 10:53 AM. ... weakness and the vulnerabilities are reported in versions prior to 6.0. Solution: Upgrade to version 6.0. Edited by AplusWebMaster, 24 September 2013 - 03:38 AM. Oct 01 2013 - "... some of Apple's forum members appear to have discovered a solution for the problem. Those suffering from the bug should disable iMessage in Settings > Messages, then reset the iPhone's network under Settings > General > Reset, then enable iMessage again. We've tried this, and our iMessage function seems to be back up and running as normal..."
Edited by AplusWebMaster, 01 October 2013 - 03:03 PM. Oct 2, 2013 - "This update resolves an issue that may cause iTunes Extras to display incorrectly, fixes a problem with deleted podcasts, and improves stability..."
Edited by AplusWebMaster, 13 October 2013 - 05:43 PM. ... update for Java for Mac OS X. This fixes multiple vulnerabilities, which can be exploited by malicious users to manipulate certain data and by malicious people to disclose potentially sensitive information, manipulate certain data, cause a DoS (Denial of Service), and compromise a vulnerable system. Solution: Apply Java for OS X 2013-005 or Mac OS X v10.6 Update 17 (please see the vendor's advisory for details). Solution: The vendor has issued a fix (7.0.3). ... vulnerabilities are reported in versions prior to 6.1. Solution: Update to version 6.1. Solution: Update to version 10.9 (Maverick). ... vulnerabilities are reported in versions prior to 11.1.2. Solution: Update to version 11.1.2. Edited by AplusWebMaster, 23 October 2013 - 09:24 AM. Impact: A local user can make purchases without proper authorization. Edited by AplusWebMaster, 15 November 2013 - 05:41 AM. Solution: Update to version 6.1.1. or 7.0.1. ... security issue and vulnerabilities are reported in version 10.9. Solution: Update to version 10.9.1. Solution: The vendor has issued a fix (5.1), available from the Mac App Store. ... vulnerability is reported in versions prior to 5.1. Solution: Update to version 5.1. Use Apple Software Update to get it. Description: A vulnerability was reported in Apple iTunes. A remote user can conduct man-in-the-middle attacks. Edited by AplusWebMaster, 24 January 2014 - 06:22 PM. ... vulnerability is reported in versions prior to 2.1. Solution: Update to version 2.1. Edited by AplusWebMaster, 24 January 2014 - 05:13 PM. Edited by AplusWebMaster, 29 January 2014 - 09:06 AM. Edited by AplusWebMaster, 24 February 2014 - 10:43 AM. Feb 25, 2014 - "OS X Mavericks v10.9.2 Update is recommended for all OS X Mavericks users. It improves the stability, compatibility, and security of your Mac..."
Feb 25, 2014 - "Available for: Windows 7, Vista, XP SP2 or later..."
... use Apple Software Update. Edited by AplusWebMaster, 26 February 2014 - 08:27 AM. "... Available for: iPhone 4 and later, iPod touch (5th generation) and later, iPad 2 and later..."
Solution: Update to version 7.1. Solution: The vendor has issued a fix (6.1). Edited by AplusWebMaster, 11 March 2014 - 08:06 AM. Solution: The vendor has issued a fix (6.1.3, 7.0.3). Edited by AplusWebMaster, 02 April 2014 - 07:23 AM.